Bjarke Ingels, architect of mountains, now has set his eyes on Everest. The New York and Copenhagen-based architect's firm BIG has been tapped by the Rockefellers to design one of the world's tallest buildings at 1,929 feet for a new commercial development in Tianjin, China, a city of nearly 13 million people. 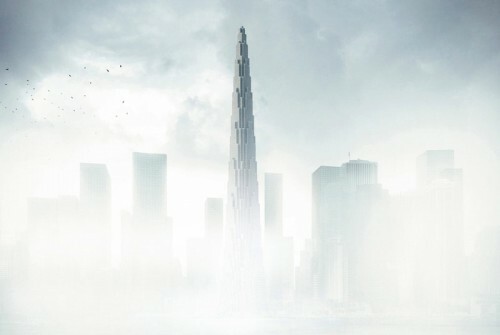 Ingels revealed a cryptic, fog-shrouded rendering of the tower on his web site—indicative of the scarcity of detail yet released on the tower—but this being the information age, AN found more information and views of the tower on a clear day. BIG is working with HKS Architecture and Arup to design the $2.35 billion Rose Rock International Finance Center set within an SOM-designed master plan for the Tianjin Binhai New Area Central Business District. The new commercial neighborhood to the southeast of Tianjin replaces a formerly industrial peninsula with a mix of high-rises, historic sites, and parks anchored by a high-speed rail station and helps to connect it to the coast. Rose Rock Group, founded by Steven C. Rockefeller Jr., Steven C. Rockefeller III, and Collin C. Eckles, held a ceremonial groundbreaking on December 16, 2011 and is promoting the new tower as a key to transforming Tianjin into "the financial center of Northern China." Renderings show a terraced pyramidal tower with a palpable vertical thrust and clear reference to the Art-Deco stylings of its inspiration, the Rockefeller Center in New York. Just as the Rockefellers built ambitiously skyward in New York 80 years ago, Ingels said in a statement, "The Rose Rock International Finance Center will be to the contemporary Chinese city what the Rockefeller Center was to the American city of the 1930s: an architectural landscape of urban plazas and roof gardens designed to stimulate and cultivate the life between the buildings." Only this time, over a thousand feet higher. On April 14 the Regional Council of Bordeaux, France announced that BIG (Bjarke Ingels Group) was selected to design the new Maison de l'économie créative et de la culture en Aquitaine, a.k.a. "la Méca." The new building on the riverfront site will house three regional visual and performing arts agencies. 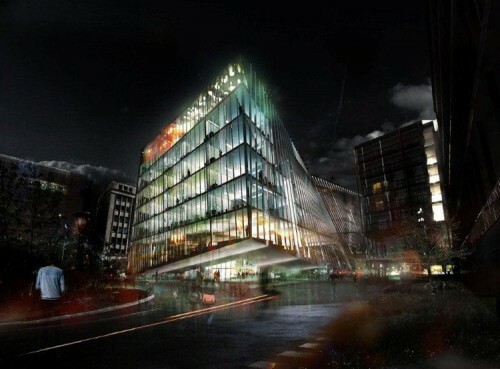 The website of France's SudOuest newspaper reports that BIG beat out SANAA and the Toulouse-based firm W-Architectures with a design for a 120-foot-tall arch-shaped building featuring a 14,000-square-foot roof terrace. The 52-million-euro scheme awaits final approval at a May 21 council meeting...stay tuned for the renderings! When Bjarke Ingels makes news, he really makes news. The superhero force behind the juggernaut that is BIG is in the running on Chicago's Navy Pier, has a giant heart pulsing in Times Square, just won a competition for Kimball Art Center in Park City, Utah, and now plans for his 49-story skyscraper in Vancouver, Canada have leaked, revealing a new "twist" on the traditional skyscraper. We've known for over a year that Ingels was planning the Vancouver tower, but now Vancity Buzz has revealed, in addition to the renderings, project details for the Beach & Howe Tower garnered from documents filed with the city. The current proposal calls for 600 residential units occupying the 490-foot-tall tower, which could become the city's fourth tallest building (and BIG's tallest tower, 40 feet taller than their W57 hybrid tower in Manhattan). Condos fill the upper floors while 180 apartments are situated in a nine-story podium base along with a mix of commercial and retail space. The program also calls for 713 parking spaces and 270 bike spaces. The development sits adjacent to the Granville Street Bridge and renderings show a lively array of uses ranging from a beer garden to a weekend market to an outdoor cinema beneath the massive highway deck. The tower's floor plate begins as a triangle at its base and rises, twisting and corbeling to form a rectangle at its summit, an aesthetic he also employed for his winning design at the Kimball Art Center. 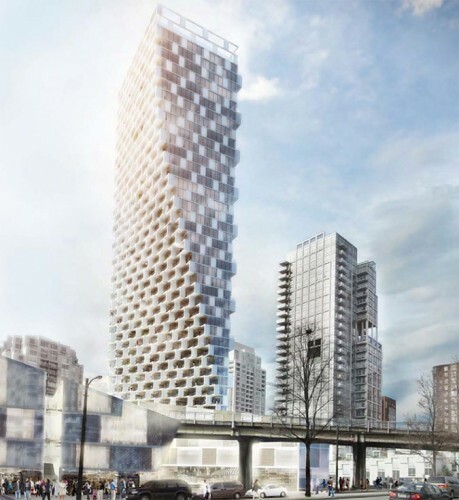 "The tower and base are a reinvention of the local typology, known as "Vancouverism." In this typology, slender towers are grouped with mixed-use podiums and street walls that define human-scale urban environments. The aim is to preserve view cones through the city while activating the pedestrian street," Bjarke Ingels said in a letter to the city of Vancouver. "The Beach and Howe Tower is a contemporary descendant of the Flatiron Building in New York City," whose site was considered unusable until technology and the economy made the iconic building possible. "Beach and Howe's architecture is not the result of formal excess or architectural idiosyncrasies, but rather the child of its circumstances," he said. Ingels said the tower's base pulls away from the busy elevated roadway, by about 30 feet, to provide extra space between residential units and the noise and pollution of traffic. The triangular shape was employed to allow sunlight to reach a nearby park. As the tower rises and concerns from noise and pollution diminish, the floor plates expand, creating the tower's twisting aesthetic. Details remain scarce at this point, but we're pretty sure the building is going to be pretty green as well. Last year, BIG (Bjarke Ingels Group) got their heart broken by the Times Square Alliance, which chose a hula-hoop happy design by Freecell Studio for its annual Times Square Valentine's installation. Now a spokesperson from the Alliance admits that they always "loved" BIG's design and were willing to give it a second chance. This year, the Alliance didn't go online looking for love. Instead, they went back to a former flirtation, and chose BIG's entry from last year, shunning the possibility of outside suitors. 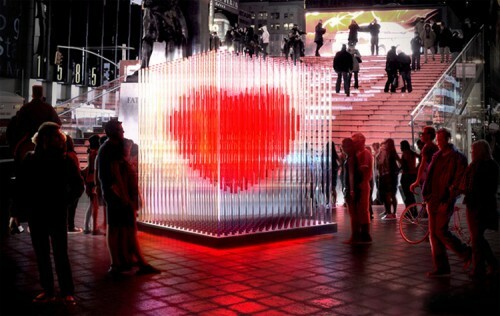 BIG calls its 10-foot high glowing heart sculpture "BIG♥NYC." The design affair was something of a ménage à quatre, with Flatcut (the fabricator), Local Projects (the interaction designers), and Zumtobel (the lighting designers) pitching in on the effort. Four-hundred LED-lit acrylic tubes wrap a cube that bounds a suspended heart. Not surprisingly, when touched the heart grows brighter. After roaring into New York last year, BIG is reaping rewards from the American Institute of Architects who bestowed an Honor Award on the firm's aptly-named "8 House" in Copenhagen (it looks like a figure-8 in plan). The AIA jury lavished praise: "people really 'live' in this newly created neighborhood," which "provides an invigorating sculptural form while creating the ramped 'pedestrian' street system." Ramps around 8 House make it bikable—from the street up to its 10th level penthouses—and two sloping green roofs total over 18,000 SF where the building reaches down to the ground. It's no mystery that Bjarke Ingels is a fan of mountains, but building craggy edifices hasn't been enough for the Danish leader of BIG. 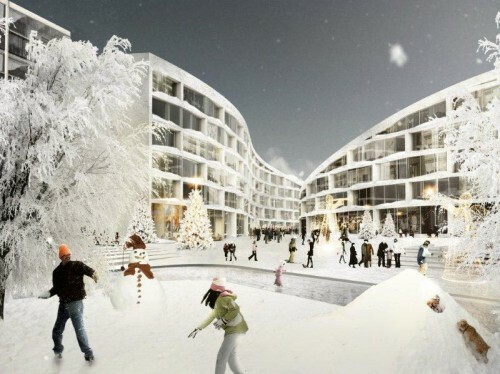 Now Bjarke has unveiled his firm's latest plans to incorporate "rooftop-skiing." 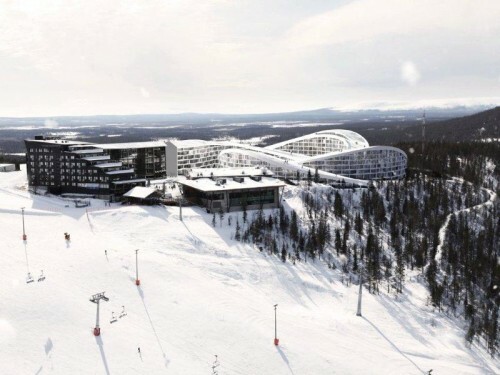 He previously proposed the Hafjell Mountain Hotel in Norway in 2007 and more recently an imperiled Waste-to-Energy Plant in Denmark that appears to have stalled. The Danish firm's latest competition-winner is a 500,000-square-foot resort called Koutalaki Ski Village in the Lapland region of Finland, consisting of four landscaped buildings that double as ski slopes. Ingels described the project as "grown from the natural topography rather than dropped from the sky." 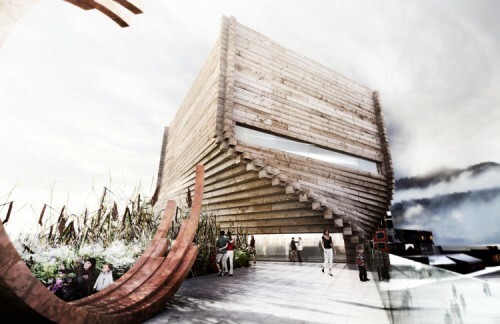 BIG's landscape-minded hybrid design "left the jury in awe," according to the Finnish developer Kassiopeia Finland Oy. The new manmade mountain is an extension to the existing framework provided by the Levi ski center. 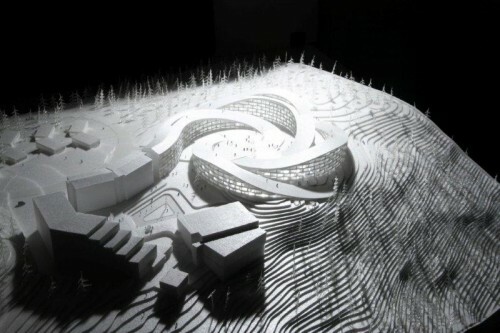 The new series of buildings will swirl out from the central square, touching the ground on both ends, enabling the skiers to descend in any direction from the rooftops. 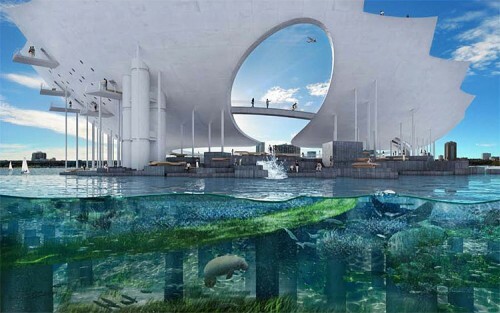 The resulting central plaza—which will be used for ice skating and music performances—will be sheltered and intimate, while at the same time open to the views of the surrounding landscapes. In the off season, the manmade landscapes will turn green, blending with the surrounding forest environment for picnics and hiking. "Banality," the theme of Storefront's Critical Halloween costume fundraiser, was manifested in an array of clever--and occasionally perplexing--forms on Saturday evening at the 3-Legged Dog in Manhattan. Blizzard-like conditions did not deter a group of over 250 design-o-philes and at least one (in)famous party crasher from getting decked out in spandex, foam, plush, rubber, tulle, and acres of cardboard. The weather did prevent Liz Diller from arriving to judge the costume contest, but her fearless partner Charles Renfro stepped into the breach, and channeling Damien Hirst in a rhinstone-studded skull mask ("Greed"), took his place alongside judges Wangechi Mutu (embodying Pantone's "Bluebird") and Justin Davidson (dressed as an architecture critic). Each of the three judges picked a winner, and all the winners happened to come in pairs: "Eyes of the Beholder" (Lisa and Ted Landrum); "1:1 Human Scale, male + female" (Kyle May and Julia van den Hout); and the intriguing "Doll Face" (Mark Kroeckel/moustache and Alison Cutlan). Some architects riffed on their own current work in the costumes (Jing Liu/SO-IL, Meissen exhibition) while others seem to reflect more a state of mind (Bjarke Ingels/BIG, King Kong with colleague Daniel as the Empire State Building; Mitch Joachim/Terreform1 as "Not Bucky"). Now Storefront and Domus are sponsoring an online People's Choice contest. 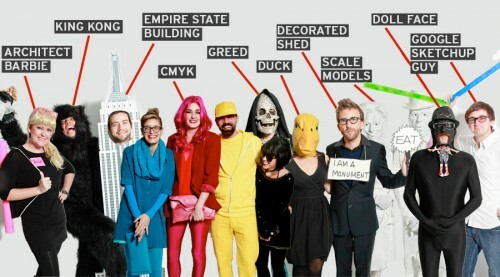 Whose costume gets your vote for most critically banal? See the line-up here.